Place bass on a baking sheet fitted with a rack; season cavity and outside with salt. Let air-dry 30 minutes; transfer to a heatproof platter. Soak mushrooms in 1 cup boiling water until softened, about 30 minutes; drain and slice. Mix mushrooms, wine, sugar, garlic, half the scallions, and the ginger in a bowl; rub over outside and in cavity of bass. Bring 1″ water to boil in a 14″ flat-bottomed wok fitted with an 11″ bamboo steamer. Place heat-proof platter with bass in steamer base and cover; steam until cooked through, 12–15 minutes. (The platter must have sloping sides to prevent the juices from spilling over.) Steam the fish until the fish just flakes when poked with a fork or chopsticks. Remove platter and carefully pour off the liquid. Sprinkle the remaining scallions over the fish and drizzle with the soy sauce. Heat oil in a 1-qt. saucepan over medium-high heat until shimmering; drizzle over fish. Garnish with cilantro. 1. Using kitchen shears, cut through the shrimp shells two-thirds of the length down the back of the shrimp. Remove the legs and devein the shrimp, leaving the shells and tails on. In a medium bowl toss the shrimp with the lime juice for a few seconds. Rinse the shrimp, drain, and set on a plate lined with paper towels. With more paper towels pat the shrimp dry. In a small bowl combine the ketchup, rum, soy sauce, and ground white pepper. 2. Heat a 14-inch flat-bottomed wok or 12-inch skillet over high heat until a bead of water vaporizes within 1 to 2 seconds of contact. Swirl in the oil, add the garlic and ginger, then, using a metal spatula, stir-fry 10 seconds or until the aromatics are fragrant. Push the aromatics to the sides of the wok, carefully add the shrimp and spread them evenly in one layer in the wok. Cook undisturbed 1 minute, letting the shrimp begin to sear. Sprinkle on the salt and stir-fry 30 seconds or until the shrimp begin to turn orange. 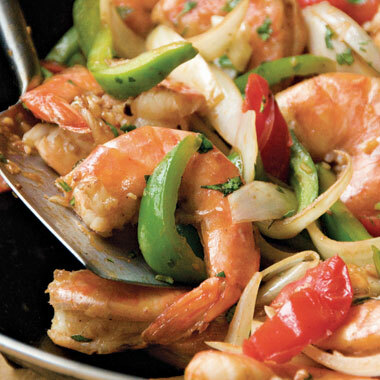 Add the tomatoes, bell peppers, and onions and stir-fry 1 minute or until the shrimp have turned almost totally orange. Swirl the ketchup mixture into the wok and stir-fry 1 minute or until the shrimp are just cooked through and the sauce coats the shrimp. Stir in the cilantro. Grace Young’s Year of the Ram appears in this week’s issue of EatDrinkFilms.com. Read an interview with Grace Young in Epicurious. More information about Grace including her blog and appearance schedule appears on her web site, GraceYoung.com. We encourage you to get Grace Young’s books at your local bookstore, but you may also order them using our affiliate links. Here are the individual titles. The Wisdom of The Chinese Kitchen from Amazon or Indiebound. Stir-Frying to the Sky’s Edge from Amazon or Indiebound. The Breath of a Wok from Amazon or Indiebound. 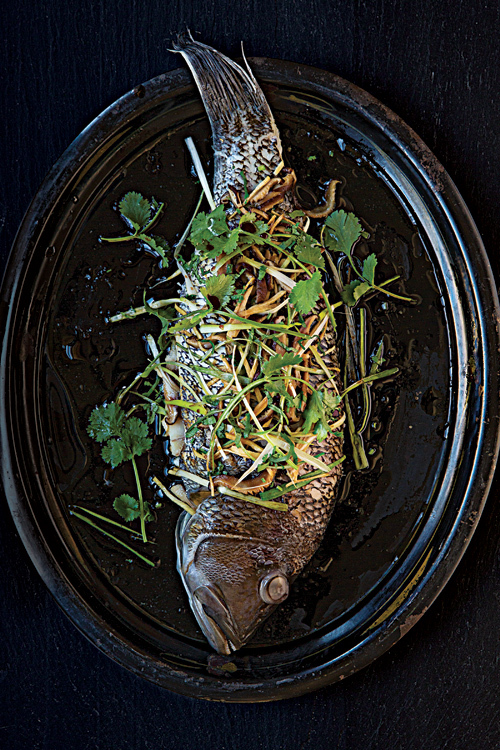 This entry was posted in Uncategorized and tagged Cantonese Steamed Bass, Chinese New Year, Chinese Trinidadian Stir-Fried Shrimp with Rum, Eat, Grace Young. Bookmark the permalink.